Jharkhand Staff Selection Commission JSSC is scheduled to conduct Post Graduate Trained Teacher Competitive Examination (PGTTCE 2017) from 5th March to 27th March 2018. A huge number of candidates who are looking for the jobs applied for the exam. Candidates who had applied are searching for the JSSC PGT Admit Card 2017 as it is the crucial document to carry for the exam and contains details regarding exam venue, roll number etc. 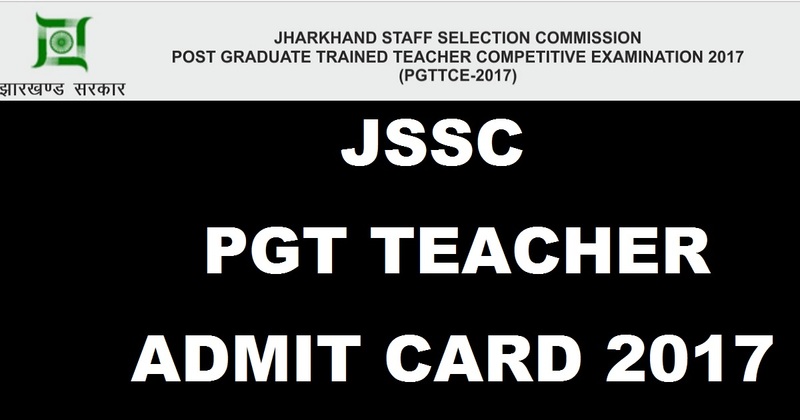 JSSC released PGT Admit Card now. Candidates can download admit card from the direct link provided below. The Jharkhand Staff Selection Commission has been started by the Jharkhand Staff Selection Commission act in the year 2008. The Candidates are very eagerly waiting for this recruitment notification. This commission conducts various exams for the recruitment of vacant positions in Jharkhand Staff Selection Commission. This year it has released notification for the Post Graduate Trained Teacher posts and the candidates who had applied can download admit card from the official website. Jharkhand Staff Selection Commission has released notification for the recruitment of candidates as Post Graduate Trained Teachers posts. There are about 3080 vacant posts for which the recruitment is announced. The vacancies are equally distributed among 11 subjects – Hindi, English, Sanskrit, Economics, Geography, History, Physics, Chemistry, Maths, Biology, and Commerce. A large number of candidates applied for the exam. Candidates who had written the exam can check the results from the direct link provided below. Without admit card candidate is not allowed to write the exam. 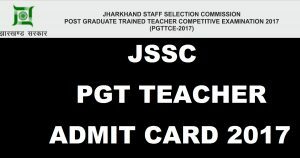 Click on JSSC PGT Teacher Admit Card 2018. Stay tuned to this website. We will update JSSC PGT Teacher answer key, results here. Press CTRL+D to bookmark this page for easy navigation.